The story of Bartow-Pell began in 1654, when Thomas Pell, a physician from Connecticut, bought about 50,000 acres from the Lenape people, who had inhabited the land for centuries. By the end of the Revolutionary War, the Pell estate comprised 220 acres, which were purchased in 1836 by a Pell relative, Robert Bartow, who built the present Greek Revival mansion. He moved into the house with his family in 1842 and they remained there until 1888, when the city of New York purchased the property along with many other acres that now make up Pelham Bay Park. In 1914, the city leased the site to the International Garden Club (ICG). The club hired the architectural firm Delano & Aldrich to restore the mansion and design the formal garden. The building opened as a museum in 1946, and in 2008 the ICG was renamed Bartow-Pell Conservancy. 1654 Thomas Pell signs treaty with Siwanoy Indians for about 9,000 acres in what is now the Bronx and Lower Westchester. 1664 The Dutch hand over New York land to the English. 1666 A land grant is issued to the Manor of Pelham by the first English Governor of New York, Richard Nicholls. Thomas Pell is named First Lord of the Manor. 1790 The property is sold to John Bartow, husband of Ann Pell. The original Pell Manor was likely destroyed during the American Revolution but the Bartows had a house on the property. 1813 Property ownership leaves the Bartow-Pell family. Land tracts sold by John Bartow to Herman Leroy, a wealthy merchant. 1836 Robert Bartow, grandson of John Bartow, resumes ownership of the property. This working farm becomes an estate with the present Mansion and Carriage House built by 1842. 1842-1888 Beginning with Robert Bartow and his family, the estate is occupied by Bartow descendants for the next four decades. 1888 The Bartow heirs sell the estate and grounds to the City of New York for inclusion in the future Pelham Bay Park. 1888-1913 The Mansion is abandoned after it was used by various private and charitable organizations. It is the only estate in the Pelham Bay community that was not demolished by mid-century. 1914 The Mansion is leased by the City of New York to The International Garden Club. Mrs. Charles Frederick Hoffman was the club founder and president. 1915-1918 The Mansion is restored and formal gardens are designed by Delano & Aldrich. 1936 Mayor LaGuardia uses the Mansion as his summer office. 1938 Included on the National List of Buildings Worthy of Preservation. 1946 The Mansion interiors are refurbished with period objects under the direction of Joseph Downs, Curator of the Henry Frances Dupont Winterthur Museum in Delaware. The Mansion is reopened to the public as the Bartow Mansion Museum and Gardens. 1959 The name Pell is added to acknowledge the importance of the Pell family in the estate’s history. 1993 Reopening of the Carriage House which was restored to its original use as a working stable. 1966 Designated a New York City Landmark. 1974 Mansion and the Carriage House are entered on the National Register of Historic Places. 1975 Principle interior rooms of the Bartow-Pell Mansion Museum are designated a Landmark by the City of New York Landmarks Preservation Commission. 1977 Designated a National Historic Landmark. 1978 Designated an expanded Landmark Site by the City of New York Landmarks Preservation Commission to include the Carriage House, the walled gardens, and a small family memorial plot. The tree under which Thomas Pell signed a land agreement with Chief Wampage and the Siwanoy Indians in 1654. With this agreement, Pell purchased a vast area including much of present day Bronx and Westchester. Although the tree has long since passed, the iron fence that surrounded it is still visible in the park. The Bartow-Pell estate’s long history began in 1654, when Thomas Pell, an English physician from Connecticut, at the urging of the English government, bought about 50,000 acres from the native Lenape people. In 1666, King Charles II chartered the Manor of Pelham, an area that included the present-day towns of Pelham and much of what is now southern Westchester County. Thomas Pell was consigned the land grant and may have begun to build a house on the property on what was then Pelham Bay, an offshoot of Long Island Sound. His heir and nephew, Sir John Pell, completed the house after 1670. It served four generations of Pells before it burned down during the American Revolution. The estate, which was made up of 220 acres by the end of the war, was sold to Herman and Hannah Leroy in 1813, but it was restored to the family when it was purchased in 1836 by a Pell descendant, the publisher Robert Bartow. The present gray stone Greek Revival mansion was built by Bartow on the site; he moved in with his wife and children in 1842. The house remained in the Bartow family until 1888, when the estate was acquired by New York City along with many acres of what is now Pelham Bay Park. The mansion was rented out for some years; beginning in 1904 it served for a decade as the Day Home and School for Crippled Children. During this time, however, the buildings and gardens deteriorated, as did several other notable mansions in the park. In the mid-1930s, when Robert Moses developed Orchard Beach in Pelham Bay Park, he determined that the mansions in the park be demolished. The Bartow house escaped that fate, however, because in 1914, the city had leased the property to the International Garden Club, which was formed to promote horticultural knowledge and agreed to restore the property for use as its clubhouse and gardens. The club hired the architectural firm of Delano & Aldrich, which restored the building and designed a formal garden that was completed in 1916. This was one of the earliest restorations in the country, predating that of Monticello in 1923. By the 1940s, the club’s fortunes had begun to dwindle, thanks to the Great Depression and World War II, and it was decided to change the club to an association for the preservation of Bartow Mansion. The building was closed for three years and reopened in November 1945 as the Bartow Mansion Museum, which was open to the public. Interior restoration, acquisition of appropriate furnishings (often loaned by other museums), and a new partnership with the Parks Department, enabled the building to become the historic house it is today. In 1959 the name Pell was added to the name of the museum, and in 2008, the International Garden Club became the Bartow-Pell Conservancy. The house and grounds, which include formal terraces, a fountain, herb and perennial gardens, as well as an 1840s stone carriage house, are owned by the city of New York and operated by the Bartow-Pell Conservancy. 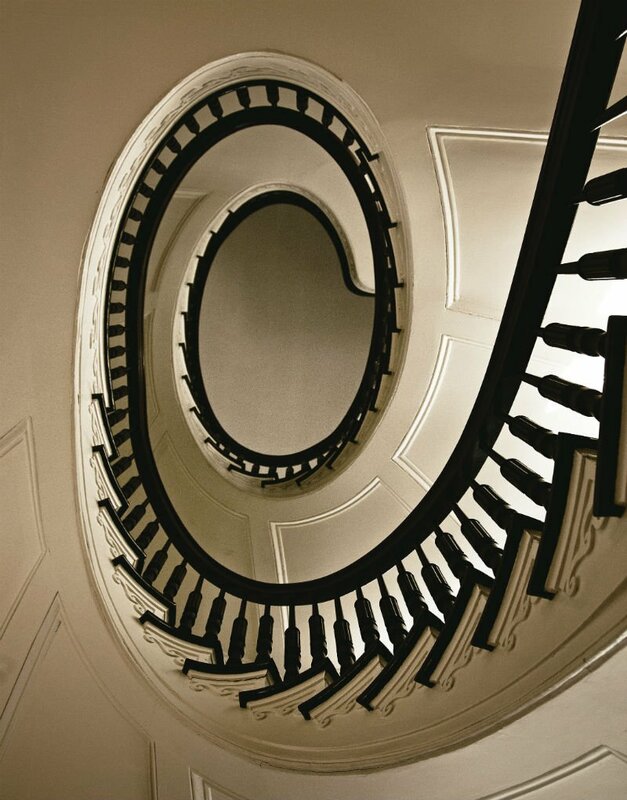 The mansion is a member of the Historic House Trust, has been designated a national and a New York City landmark, and is on the National Register of Historic Places. 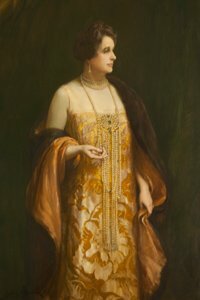 The portrait of Mrs. Charles Frederick Hoffman (née Zelia Krumbhaar Preston, 1867–1929) by the British artist Sydney Percy Kendrick (1874–1955) projects the calm intelligence, sophistication, and vision that befit the sitter. Prominent in New York, Newport, and English society, Zelia Hoffman left a legacy that includes the International Garden Club and the preservation of the Bartow Mansion. Enthusiastic about the exchange of American and European horticulture, in 1914 she was a founder of the International Garden Club, and president from 1914 to 1921. Under her leadership, the club leased the Bartow Mansion from New York City for use as its headquarters and began the restoration of the house and gardens. She was also a founder and president of the Newport Garden Club, and her gardens at Newport and at Norfolk, England, were famous. The portrait was painted posthumously from a photograph in Kendrick’s London studio. A figure, genre, and landscape painter active during the early modern period, Kendrick was also a painter of fashionable portraits. Born in London, he studied art in Paris and exhibited at the Royal Academy and in the provinces. The painting, with its simple dark background and sense of formality, is a perfect foil for Zelia Hoffman and is characteristic of the artist’s grand manner portraiture. Thomas Pell’s Treaty Oak may be the only tree to have merited an newspaper obituary in the New York newspaper, The Sun. 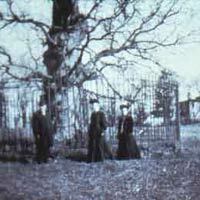 The article appeared on April 9, 1906, and announced the death of the giant white oak. Until then, the tree had stood for years on the grounds of the Bartow Mansion on Shore Road in Pelham Bay Park. Tradition holds that beneath its limbs more than 250 earlier, Thomas Pell had signed a treaty with the Lenape people, who had inhabited the land for hundreds of years, and acquired about 50,000 acres, including what we know today as Pelham, New Rochelle, parts of Bronx County, and much of the land east of the Hutchinson River north to Mamaroneck. Thomas Pell of Fairfield, Connecticut was among the earliest Englishmen to establish settlements in today’s lower Westchester County. He traveled from Fairfield in 1654 to sign the treaty with Siwanoy sachems only eleven years after the Siwanoys massacred another famous settler, Anne Hutchinson, along with most of her family. Pell’s successful negotiation of the treaty for the purchase of what came to be known as the “Lordshipp & Mannour of Pelham” had enormous implications for the dispute between the English and the Dutch over control of the area. The tract was huge. The Dutch claimed some of it. Effective control of the lands could block any further northward movement of Dutch settlers – at least along the shore of the Long Island Sound westward to the Hutchinson River. The enormity of Pell’s move was not lost on Dutch authorities. They confronted the English settlers who arrived in the area, although they were unsuccessful in their efforts to stop the English from settling here. Ultimately, the strength and resolve of Pell and the English settlers were fruitful. The Dutch, facing a war with England they knew they could not win, surrendered New Amsterdam to the English on September 8, 1664. New Netherland, including Westchester, passed out of the hands of the Dutch. On October 6, 1666, Thomas Pell’s rightful ownership of virtually all the land transferred by the Siwanoys in the 1654 treaty was confirmed by royal patent, signed and sealed by Governor Richard Nicolls. Most historical accounts say the Treaty was signed beneath a “Treaty Oak” on November 14, 1654. It appears from a contemporary handwritten copy of the Treaty, however, that it was signed on June 27, 1654. On that date, Thomas Pell and a small band of Englishmen reportedly gathered beneath a giant oak tree along with a Siwanoy named Anhõõke, also said by some to be known as Wampage, and four other Siwanoy Indians who have been described as “sub-chieftains”. Wampage is widely believed to have been the murderer of Anne Hutchinson. The whereabouts of the original Treaty are not known. Fortunately, though, a copy exists in what is said to be Thomas Pell’s own handwriting. He reportedly created it and forwarded it to relatives in England from whom it has been retrieved and documented. There is no record of the price Thomas Pell paid for the land. His copy of the Treaty says only that the sellers received “trou valew & just Satisfaction” for the land. Westchester Historian Thomas Scharf, however, reported in 1886 that the “Indians received, it is said, as an equivalent for their deed of the land, sundry hogshead of Jamaica rum.” Thomas Pell reportedly took symbolic possession of his estate “by burying his seal with his arms at the root of the oak”. The historic Pell Oak, a fine old tree eighty feet high, at the junction of the New Rochelle and Prospect Hill Roads, under which Lord Pell stood when he signed a treaty with the Indians early in the eighteenth [sic] century, for the property now comprising the northeastern section of the Bronx, was destroyed by fire early yesterday morning. Several years ago the Park Commission had a fence put around the tree, which began to show signs of decay, in order to make it last as long as possible. Recently a pile of dead leaves and brush accumulated within the fence, and it is supposed that some one threw a lighted cigar or cigarette there, starting the blaze. Before any one could put the fire out the flames spread to the tree and burned it to a blackened stump. A landscape report subsequently prepared on behalf of The Bartow-Pell Mansion Museum described the demise of the tree somewhat differently, though not necessarily inconsistently. It says: “in 1906 some young boys started a fire which swept up into the trunk, effectively ending its life.” The fire was tragic. But, it seems, the tree had been dying for years. Sometime prior to 1902 the tree was broken in two by a storm, yet, despite a hollow trunk, it continued to thrive. In 1906 some young boys started a fire which swept up into the trunk, effectively ending its life. The following March the dead tree was blown over in a wind storm, leaving a small stump contained within the iron fence which survived for a few years… Once the gust of wind blew over the dead tree, the sad remnant of Thomas Pell’s Treaty Oak lay decaying on the ground “having crashed its way through the iron railing” built to protect it. Death destroyed neither the legend nor the symbolism of what was known as “Thomas Pell’s Treaty Oak”. On May 1, 1915, the Governor of New York reportedly attended ceremonies during the formal opening of the Bartow-Pell Mansion as the clubhouse of the International Garden Club and planted a red oak near the site where the tree had once stood to honor Thomas Pell’s Treaty Oak and all that it had come to symbolize. Thomas Pell’s Treaty Oak lives on, so to speak, in another way. Pieces of what are said to be the venerable old oak are scattered among the collections of local historical societies in homage to the tree and what it came to symbolize. Most of the circular, eight-and-a-half foot high iron fence that surrounded Thomas Pell’s Treaty Oak in its final years still stands more than a century after it was first built. It was erected as a “safeguard against the depredations of relic hunters” who doubtless contributed in some measure to the rapid deterioration of the oak in 1903. As you turn from Shore Road in Pelham Bay Park through the stone-columned gate and enter the Bartow-Pell estate, look into the wooded area to your right. There, about thirty yards from the roadway amidst the trees and shrubbery, is what remains of the circular fence where the Treaty Oak stood. Was the oak on the Bartow-Pell Estate that burned in 1906 the actual tree beneath which the Siwanoys granted their lands to Thomas Pell in 1654? No one knows. Biologically, it would seem possible. White oaks remain among the most abundant oaks in the eastern United States and have been known to “live to great age, over 1000 years in some cases” and to reach heights of up to 107 feet. Such passages suggest their authors believed the tree no longer stood at the time of their publication. One possibility is that the passages were mere lapses of unintended ambiguity in each of the two-volume histories of Westchester County. Sadly, that may be wishful thinking. Just as the Bartow Mansion had been erroneously thought to be the Pell Manor House, over time the oak that was enclosed in the iron fence became associated with the Treaty Oak. However, numerous accounts by long-time local residents seem to have put the matter to rest. . . . With the erection of the iron fence in 1903, the site of this oak tree seemed to be indubitably linked with the historic event of 1654. However, the claim was refuted in an article in the Seventeenth Annual Report of the American Scenic and Historic Preservation Society (1912) which stated that the iron fence in the Bartow House grounds does not indicate the site of the Treaty Oak. In addition to studying the written sources, the author had consulted with Anne J. Bolton, the daughter of the Rev. Robert Bolton who lived nearby in Pelham, who said that it had stood between the Pelham Bridge and the entrance to the Bartow place alongside the Post Road; she remembered that, travelers on the Post Road were accustomed to stop their horses under its branches to enjoy its refreshing shade. Later authors writing about Pelham Manor noted the disputed claim, but acknowledged, that despite a possible historical inaccuracy, the iron fence helped to keep alive the memory of the treaty between Thomas Pell and the native Americans. The plot is surrounded by low iron railings connecting four corner granite posts engraved with the Pell family coat of arms, the pelican. It was erected in 1891 by descendants of Benjamin Pell, grandson of Thomas Pell, Lord of the Manor according to the inscription on one of the posts. Joseph Pell (1722-1752). Joseph was the oldest brother of Robert Bartow’s great-grandmother Bathsheba Pell Bartow. Sussannah Pell Drake (1741-1763). Sussannah was a daughter of Joseph and Phoebe Pell. Her brother, Thomas Pell, married Margaret Bartow, Robert Bartow’s great-aunt. In 1790, 200 acres of the Pell estate property were conveyed to John Bartow, Robert Bartow’s grandfather, by his brother-in-law Thomas Pell. Joseph Pell, 4th Lord of the Manor, was the son of Anna and Thomas Pell II and was married to Phoebe Pell. Sussannah was a daughter of Joseph and Phoebe Pell. She married Benjamin Drake on December 29, 1759. After her death he married three more times. Phoebe Pell was married to Joseph Pell, who died in 1752. On November 18, 1762, she married James Bennett. Here lyes the body of Saloma Pell, born Jan. ye 13th, 1759, and departed this life Octr. ye 10th, 1760. Aged 1 year, 8 months & 27 days. In Memory of John, son of James and Phoebe Bennett, who died Augt. 6, 1765, aged 2 months. John Bennett was a son of James and Phoebe Pell Bennett (Joseph Pell’s widow).